Each summer JLL conducts a survey of retail malls in Tianjin and this year a few trends have started to emerge or solidify. The first piece of good news is that the air will start to clear, or at least construction dust is less likely to be coming from retail projects. For the past decade Tianjin has undergone a boom in retail construction and that is clearly slowing down. The year 2015 was the peak in retail construction and it looks to continue slipping down from there. 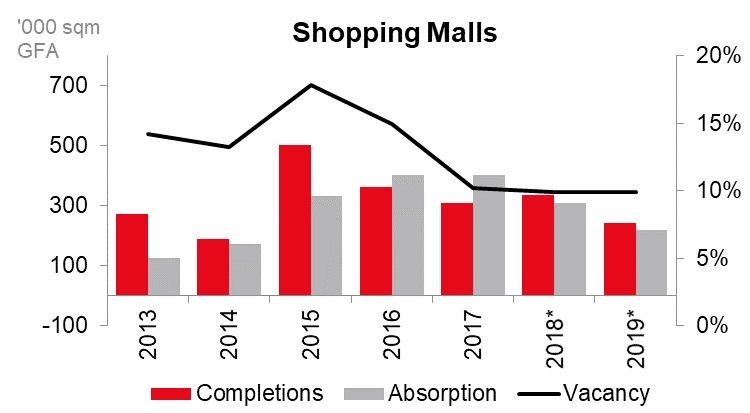 Another good news for mall operators is that vacancy levels look to be settling at around 10%. For our analysis of supply we looked at 33 malls constructed over the past 15 years and for our more detailed look at tenant types we focused on detailed tenant mix for 18 malls across the city. 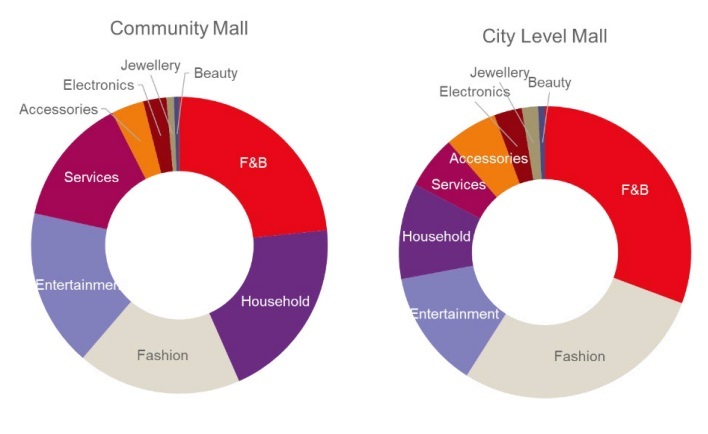 Our analysis shows that there is a significant divergence in the types of retail found in malls in the city centre versus those in suburban areas. This may seem obvious now, but back in 2015, this specialization was much less pronounced. In 2015, two big malls (Delight City in Nankai District and Aegean in Hedong District) with more than 150,000 sqm of GFA (gross floor area) each entered the market, pushing up the new supply which reached a record high that year. By contrast, in 2018 and 2019, we forecast no malls bigger than 150,000 sqm will come up on the scene. One reason is that some new projects are positioned as community malls which cover a smaller residential catchment and so the malls are also smaller. Examples include CRCC Mall in Hebei District and upcoming Dacheng Zhonghuan Plaza in Hongqiao District. Another reason is that even malls in high traffic central city locations are limited by a smaller GFA allocation within a larger mixed-use complex. Metropolitan Plaza and Joy City Heping, both located on Nanjing Road and operating since 2016 are examples. 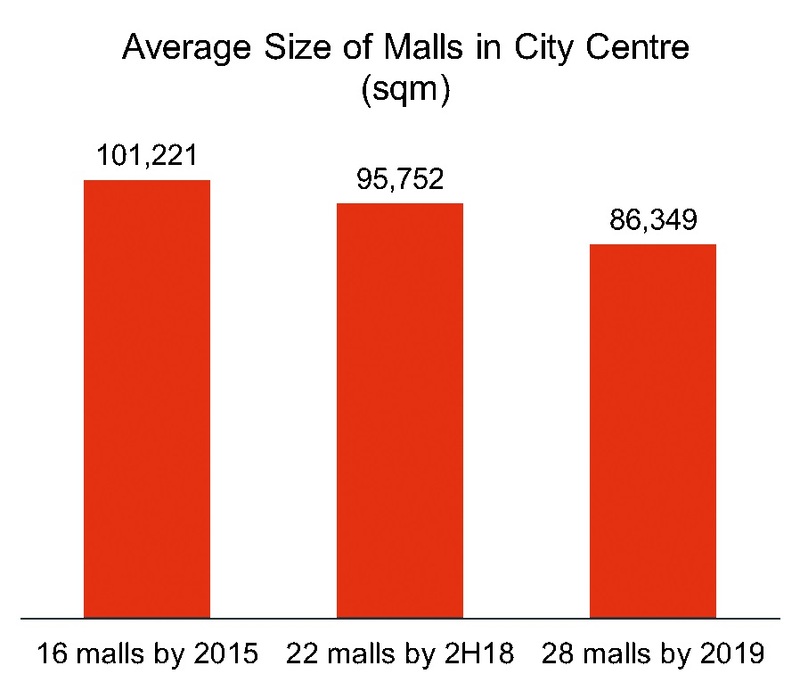 As a result, we observe that the trend of “shopping malls are getting bigger” has stopped and the average size of shopping malls in city centre went down in 2018. It is expected to keep slipping down for the foreseeable future. During our site visits it was pretty clear that malls are taking their cue from their retail catchment, in other words their shoppers. Some suburban malls for example have large areas for kids, supermarkets and furniture. This is in line with their neighbouring residential complexes and what those shoppers need. Some downtown malls on the other hand have completely eliminated retail for kids, and instead focus on Food and Beverage, specifically trendy restaurants and coffee shops that are attractive to white collar workers in nearby office towers. - More than 30% of retail space in city-level malls is occupied by F&B tenants, including casual dining, fast food and snack stands. “Wanghong” restaurants (popular in social media) and cafés, such as Da’an milktea, started to enter the market but are expanding slowly as compared to Tier I cities. - Fashion brands in city-level malls accounted for 28.3% of retail space, much higher than the 17.9% that fashion brands occupied in community malls. The fashion shopping function in community malls is decreasing, while demand for life services and daily needs purchasing is growing. - Kids’ related brands in community malls stood at 12.3%, which was double the proportion of space taken up in city-level malls at 6.1%. Our survey also allowed us to see how retail in Tianjin compares with that in Shanghai. 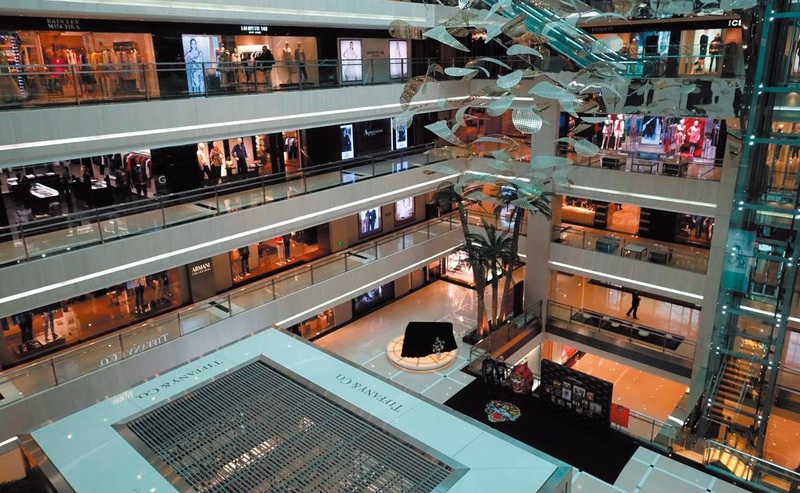 As compared to the Tier I city, Tianjin malls in the city centre are actually pretty similar in terms of retail type, even if Shanghai does have a wider variety of brands and international retailers. However, Tianjin suburban malls look quite different from Shanghai malls in decentralised areas. In Tianjin suburban areas, the retail sector combining fashion, accessories, jewellery and electronics took up 25.3% of leased space versus 45.7% in Shanghai. And in Tianjin, household and services tenants took 34.1% of space versus only 18.9% in Shanghai. So we aren’t sure why, but the data tells us that shoppers in Shanghai have similar retail choices in urban or suburban locations, but in Tianjin, the options are quite different between downtown and suburban settings. 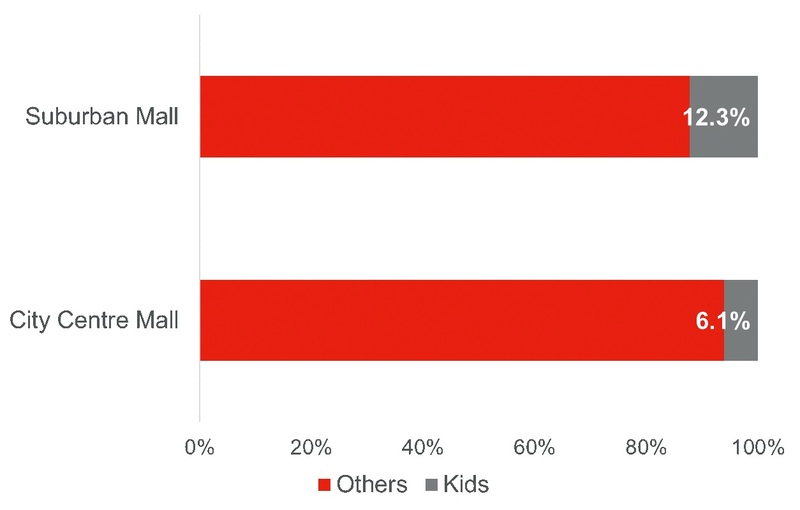 In conclusion our recent survey of Tianjin retail malls has highlighted a couple of trends. First, the overall supply of retail space coming into the market is slowing and new malls will be smaller on an average. As a result, we believe vacancy rates are set to stabilize at around 10%. One of the reasons for this slowdown in supply is because most of the planned mega malls have been completed (Galaxy Mall, Riverside 66, Joy City) and subsequent supply of retail comprises mostly of mixed use projects that also have office towers or hotels and retail is a relatively smaller component. Second, there is a growing distinction between suburban retail and retail in the city centre in Tianjin. Part of this difference is based on space constraints and some of it is based on shopper types, but in general suburban malls have more retail focused on kids, more supermarkets and more furniture. Finally, the story about retail in the next five years won’t be about the new mall, but rather the best managed one. Our site visits this summer showed us that there is already a big gap between the best and worst managed retail centres. Competition for retailers and shoppers means management teams that can run their malls successfully will be the ones to attract shoppers regardless of location.